These photos are taken from the book "Marie Rose Ferron -A Photo Documentary" by Eugene N. Szynkowski. 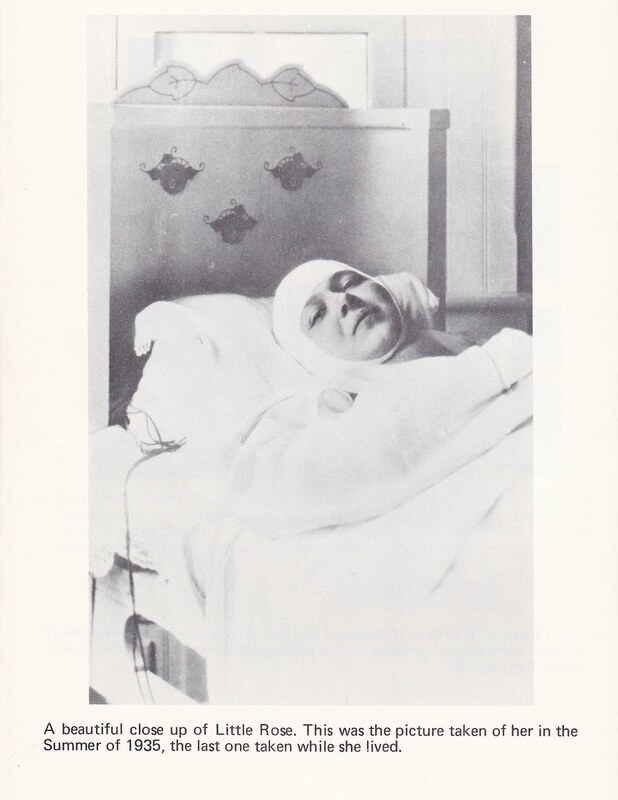 This excellent booklet contains many photographs of Marie Rose Ferron and her family. 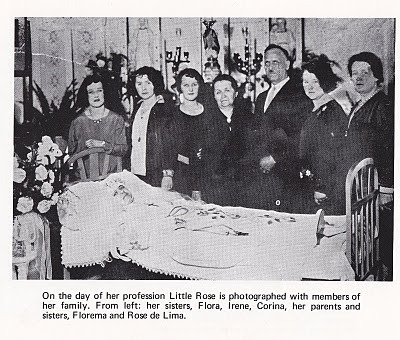 A short biography of the life of Marie Rose Ferron to accompany these photos. 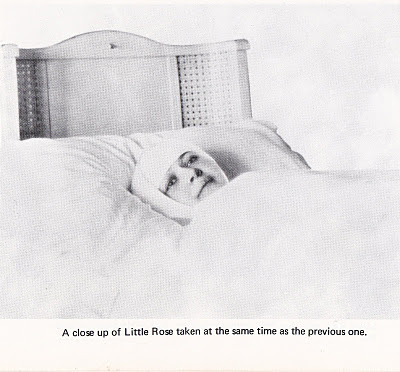 Little Rose was born St. Germain de Grantham, Quebec in 1902 to a large, working-class family. When she was four years old, her family immigrated to Fall River, Massachusetts. 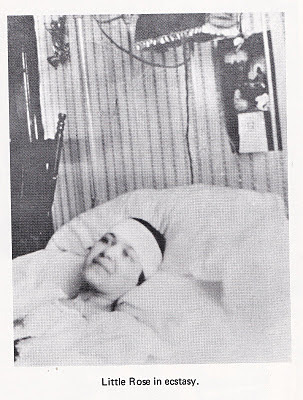 In her mid-teens, Rose was stricken with a mysterious illness which confined her to bed; she accepted suffering as a vocation. In 1925, the family moved to Woonsocket, Rhode Island, where Rose spent the remainder of her life. At around age 5 Our Lord appeared to her in a vision for the first time. Later when asked about this vision Rose said, "I saw the Child Jesus carrying a cross and He looked at me with grief in His eyes." From that time on Jesus visited Rose and spoke to her and she spoke to Him. 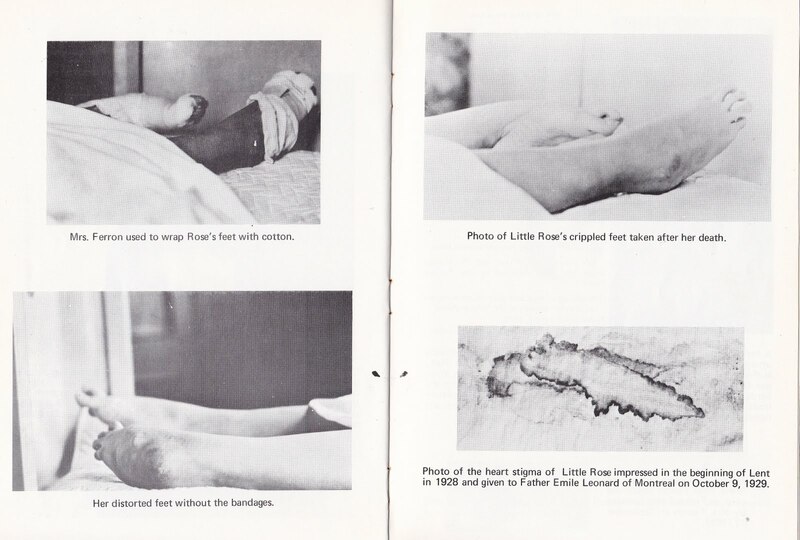 In 1926 and 1927 Rose received the stigmata or wounds resembling those of Our Lord, and on Fridays she suffered the Passion in honor of His Sacred Wounds. Often when she spoke to Jesus her family heard her asking Our Lord to spare others and to give her instead their miseries and sufferings. Many souls have reported seeing Rose in ecstasy and also crucified with Christ, reliving the Passion of Jesus in her own body. During the last ten years of her life she was confined to her bed and she had to lie on her back on a quilt-covered plank or board. She went to her reward on May 11,1936 at the age of 33. Her life, her sufferings and her death were all for the same reason; for love of Jesus and for love of souls. 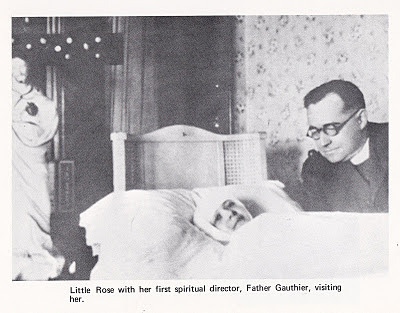 I think a little more investigation is needed before calling "Little Rose" a mystic of the Church. It depends upon which Church you speak of - the American Orthodox Church or the Roman Catholic Church. The shrine dedicated to Little Rose, which is here in southeast Michigan, has no recognition by the Catholic Church or the Archdiocese of Detroit. Note who is presiding at her "glorification" at the shrine. (and see that she is considered by this group of Orthodox to be a saint. St. Marie Rose Ferron was Glorified in the Orthodox Church of America, Ukrainian Autocephalous Orthodox Church on July 17, 2004. This is not to say that this woman did not live a holy life. That she was Catholic and ended up venerated by the Orthodox and not Catholic is a bit odd and begs for questions. Both my father and uncle were devoted to Little Rose and I recall them speaking of her. But then they let go of devotion to her when the Catholic Church did not recognize her. How else did her cause end up in the care of the Orthodox if it wasn't because the Catholic Church found reason not to pursue the matter? I think more background on this is needed and I really don't think she should be labeled a mystic of the Church when the Catholic Church does not recognize her as a mystic. Thanks so much for your comments and for the link and info that you kindly provided. While I think that it is inspiring that the American Orthodox Church has recognised Rose's heroic virtues, and that they are inspired by her holy life, nevertheless the fact remains of course that Rose herself was always a devout and practising Roman Catholic, until her death at age 33 in 1935. And of course the "Glorification" ceremony by the Ukrainian Autocephalous Orthodox Church on July 17, 2004 was done solely through their own initiative. In regards to her being a "Mystic of the Church", well you are most certainly right that she is not specifically a "recognised" mystic within the Catholic church. But then, many of the mystics on this website are not specifically recognised by the Church either. The key criteria that I use to determine whether a soul should be listed on this website or not is whether there has been a negative judgement by the Church (ie- normally the local Bishop) concerning the individual in question. Additionally I look for support from priest-spiritual directors that knew the indivudual in question intimitely. Bishop McVinney on on Jan. 9, 1964 that was not a condemnation of her (alleged) mystical gifts or virtues, but was simnply a request that promtion of her proposed cause for beatification be halted. And that has been the only public statement over the years from the local Bishop concerning Marie Rose Ferron. So, in the absence of any negative Church judgements concerning her, like many the other (alleged) mystics on this website, I have come to the conclusion that it is appropriate to have her included here because her spiritual life and mystical graces were studied in depth by her spiritual directors who were very competent priests. In fact, as you probaly know, one of her spiritual directors, Father Onesime A. Boyer wrote a popular biography about Marie-Rose entitled "She Wears a Crown of Thorns". Father Boyer was a very well repected priest from New York who was well educated in mystical theology. Additionally, the Jesuit Father John Baptist Palm has written an extensive book entitled "Tape Recorded Little Rose Testimonies." which is an extensive collection of transcribed eye witness interviews concerning Marie-Rose's life. To give an idea of the documentation in support of Rose in this one book, this book is 2094pages of small typed (8 point text)transcribed interviews. A third example would be the book "Crucified with Christ" written by Father Herbert George Kramer S.M. In it he devotes a chapter specifically to Marie Rose and her mystical gifts. So, in the absence of any negative Church judgments, there obviously also has been some significant documented positive support from her spiritual director and also other priests within the Church to reasonably conclude that her holy life is edifying and inspiring and well worth investigating. I hope that this explanation sufficiently addresses your comments. By the way, permit me to say that I do appreciate your "Te Deum" blog and your efforts in support of the judgements of the Bishop of Mostar. Sorry I didn't get back here sooner. Have you contacted Bishop Tobin of Providence and asked he to take a look at the case again? Another thing comes to mind is that if the original bishop wanted the pursuit of the cause to be halted, perhaps something was found that would not permit it to go any further, but was not publicly shared to avoid detraction, or to preserve her dignity. There are many more saints than are recognized by the Church. Some are elevated for us by the Church because God wills it. This comes through the Church. The question in my mind is, does God will for there to be a devotion to, and following of Marie Rose Ferron? Perhaps the only way to know is to ask the current bishop to probe the files, closely, and consider re-opening the case. If he does so, then God wills it. If he says, "no", then perhaps it is not God's will. This still doesn't mean that Marie Rose Ferron didn't lead a holy, or even saintly life. I just think we need to use some caution in spreading new devotion today to someone whom a past bishop seemed to ask that a cult following not be formed. We aren't privvy to what caused that bishop to make the decision that he did. In fact, back in 2006, I wrote to His Excellency, Bishop Tobin of Providence, RI. in regards to Marie Rose Ferron, and I recieved a kind reply from the Vicar General, Rev. Monsignor Paul D. Theroux, which spoke of an recent diocesan investigation into Rose's life in 1996, which reveals at least, a certain openess and consideration on the part of His Excellency in what concernins the life of Marie Rose Ferron. Ultimately of course I completely acknowledge that it is up to the Church guided by the Holy Spirit to decide in what concerns Marie Rose Ferron, and I leave it to the good God to raise Marie Rose to the altars if such be His holy will. 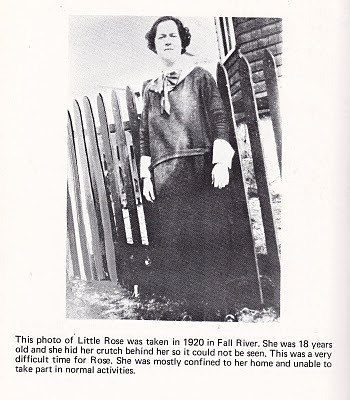 The story of Little Rose Ferron has intrigued me for years. She was a distant relative of mine, a cousin of my grandmother who was also a Ferron. I remember meeting a Catholic woman from Fall River who referred to her as the "patron saint of Fall River", even knowing she was never recognized as a saint. It seems that many Catholics consider her with higher reverance than the clergy. Thank you for providing some insight on this page about the cause for not being beatified (yet). When I think of Marie Rose Ferron, a mystic and stigmatic "saint" of the Church. I am reminded of the same thing, that had happened to Teresita Castillo, the seer of the Lipa apparitions of our Lady, under the title Mary, Mediatrix of all Grace. The church condemns the apparition after 3 years of flourishing through the efforts of the Carmels. It was suppressed and the Bishops in the Philippines were ordered to sign documents pertaining of its non-supernatural origin, and under the threat of excommunication. And now, in the late 90's the lay together with priests and bishops had urged the church to recognized her apparition in Lipa, and to have it approved under Vatican. I hope that this will be of the same of our Little Rose, as time passed by the people will either forget her, or the important witnesses for her cause will eventually die in time. ITs in the hands of the Laity to urged the local Bishop to reconsider her cause and to re-open the Cause of her Beatification. Glen, is the mystic you read about and returned to the faith by her story Eileen George? To reply to your question, no, it is not Eileen George. But stay tuned because when she passes from this life to go to see God I will be posting here information/biography about her life. I also Would like to know more in due time. Thank you for sharing the story of Marie Rose Ferron. I also am related to her. My great Aunt was Rose Myette.